Info: The following information applies to Content Station version 9.2.1 or higher and Enterprise Server 9.2.1 or higher. Note: Since Enterprise 9.2.1, the method of setting up this default article has changed. Use the link below to view the functionality for versions older than Enterprise 9.2.1. An article template named 'default' which is set up across all Brands. In this file, the styles for formatting the text are defined. A configuration file named componentDefs.xml in which the article components are defined which should be included by default in the article, as well as the article components that can optionally be added to the article after it has been created. Both files are retrieved and cached when the user logs in to Content Station. When the New Article button is clicked, the new article is created based on the information in the cached files (this process is explained in more detail at the end of this article, see Setting up the default article for Content Station 9). The article template determines which styles are available for formatting the text. It is used across all Brands. Step 1. In Enterprise Server, set up a Brand that can be accessed by all users who need to create new articles. Step 2. Create the article template. When using InDesign, geometry information is stored with the article, describing where on the layout the article is placed and what the dimensions of the frame are. However, article templates that contain such geometry information cannot be edited, meaning that when the template needs to be modified, a new template needs to be created. When using InCopy, no geometry information is stored with the article, so such articles can be easily edited at any time. When using InDesign, an unlimited number of article components can be created. When using InCopy, the article will only contain one component. Note though that if the article template is only going to be used in Content Station, the article template only needs to have one component. This is because the actual number of article components is controlled by the componentDefs.xml file. Article templates that are also going to be used in InDesign or InCopy are not controlled by this file and therefore need to be set up in the way they are going to be used. For an environment in which the article template is going to be used in InDesign, InCopy and Content Station, creating the template in InDesign is therefore the best method. Step 2a. Create a new layout. Step 2b. Create one or more text frames and assign an appropriate Element label. Step 2c. Define the required paragraph styles and character styles. Step 2d. Save this article as an article template to the location specified in Step 1. Make sure to name the file 'default' (lower case, without the apostrophes). Step 2a. Create a new document in InCopy. Step 2b. Create any paragraph styles and character styles as necessary. Step 2c. Save this article as an article template to the location specified in Step 1. Make sure to name the file 'default' (lower case, without the apostrophes). The componentDefs.xml file defines which article components should be included by default in the article, and which article components should be available to optionally add to the article at a later stage (by using the Components list in the Multi-Channel Text Editor). The file can be configured to work across all Brands and/or to work across specific Brands. The article components are defined between the <components> </components> tags. name is the name of the component. Make sure that it corresponds with the name of the components that are set up in other areas of Enterprise, such as in Smart Connection for InDesign and InCopy. default determines whether the component should be included when a new article is created or should be made available to be added manually. Possible values: "true" for automatically added, "false" for not manually added. allowmultipleinstances defines if the component can be used more than once. Possible values: "true" and "false". Note: When this value is set to "false", the component is removed from the Components list in Content Station as soon as the user adds the component to the article (thereby allowing the component to be used only once). Example: You might want to use this for components such as the "graphic" component to allow the user to add multiple images to the article. Step 2. Configure the required default components and optional components as necessary. The following is an example of the 'head' component which is added automatically each time a new article is created, as defined by the 'default=true' status. The following is an example of the 'caption' component which has to be added manually, as defined by the 'default=false' status. The <components> </components> tags are themselves placed between the <brand> </brand> tags. These carry an ID by which you can define to which Brands the settings apply. Note: When this line of code is not provided or is set to 'true', the settings for the default Brand are used. Typically, you would have settings set up for a default Brand, plus additional settings for each specific Brand. Example: Here, settings for a default Brand is set up and one additional group of settings for Brand with ID '1'. The article template named ‘default’ is retrieved and cached in Content Station. The componentDefs.xml file is loaded. The cached template in combination with the componentDefs.xml file is used to create the new article. The article components in the template are compared to those defined in the componentDefs.xml file. When an article component is present in the template but is not defined in the componentDefs.xml file, the article component is not included in the new article. When an article component is defined in the componentDefs.xml file as 'default=true' but is not present in the article template, it is included in the new article. One or more article templates in which the default article components and the styles for formatting the text are defined. Multiple article templates can be set up within a Brand, each with different components and/or styling. This way, individual templates can be set up for each Publication Channel. A configuration file named componentDefs.xml in which the article components are defined that can optionally be added to the article after it has been created. The required article template is retrieved from Enterprise Server at the moment when Content Station actually needs to create the article. If an article template is present, Content Station first checks if the Brand, Publication Channel and Category properties of the article template are set to the same values as the values of the Brand, Publication Channel and Category properties of the Dossier. If this is the case then that article template is used. If this is not the case, Content Station checks if the Brand and Publication Channel properties of the article template are set to the same values of the Brand and Publication Channel properties of the Dossier. If this is not the case or when no article templates where present in the Dossier to begin with, then Content Station checks if any article templates outside of the Dossier exist. 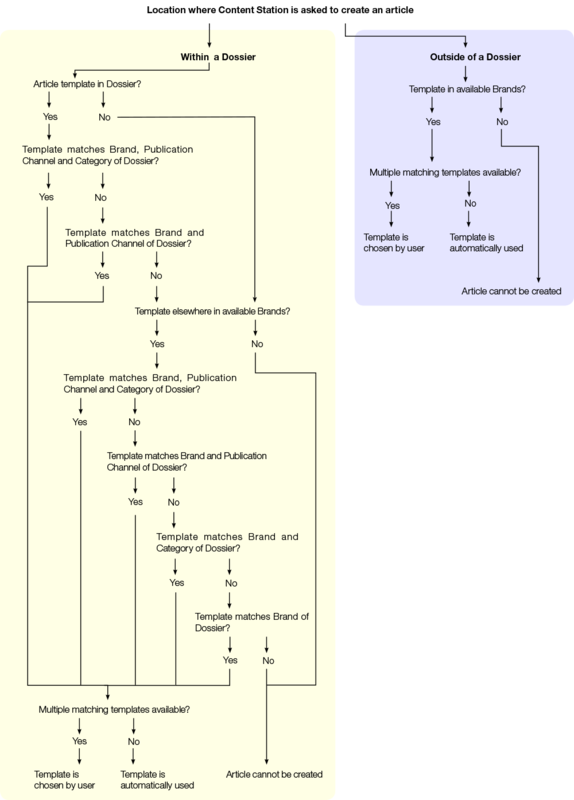 If a template is found outside of the Dossier, the same types of checks are made to see if any combination of Brand, Publication Channel and Category of the article template as listed above match those of the Dossier. If a match is found, that article template is used. The scenario where the request to create a new article template is made outside of a Dossier is somewhat different because no context exists that can be used to match the properties of the article template with. In these scenarios, any template that belongs to any Brand that the user has access to is returned. In scenarios where more than one template is available, all these templates are shown to the user. The user will then have to choose which of the templates to use. When no templates are available, a message is shown. No article can be created until at least one suitable template is available. Context: A Dossier is opened that is assigned to Brand 'WW News' and Category 'News' and its content is viewed by having the Dossier Content selected. The Dossier does not contain any article templates. Action: The Create Article button is clicked. Result: Content Station looks for any article templates in the Dossier that are assigned to Brand 'WW News' and Category 'News'. No article template is available in the Dossier so article templates elsewhere in the system are referenced. Article template #1 'ww-news-print-news-default' is the only one in the system with a corresponding Brand and Category. Therefore that template is used. Context: A Publication Channel of type 'Print' is viewed that is assigned to Brand 'WW News' and Category 'Sport'. The Dossier does not contain any article templates. Result: Content Station looks for any article templates in the Dossier that are assigned to Brand 'WW News', Publication Channel 'Print' and Category 'Sport'. No article template is available in the Dossier so article templates elsewhere in the system are referenced. Two article templates exist which have the same Brand, Publication Channel and Category combination: #2 'ww-news-print-sport-default' and #3 'ww-news-print-sport-football'. A window appears showing these 2 templates from which the user has to make a choice. Context: A Publication Channel of type 'Print' is viewed that is assigned to Brand 'WW News' and Category 'Sport'. The Dossier contains the article template 'ww-news-print-sport-default' which is also assigned to the same Brand/Publication Channel/Category combination as the Dossier. Result: Content Station looks for any article templates that are assigned to Brand 'WW News', Publication Channel 'Print' and Category 'Sport'. Because the article template that is present in the Dossier matches the Brand/Publication Channel/Category combination of the Dossier, that article template is used. Note:This scenario is similar to scenario #2, but now with an article template added to the Dossier itself. Even though 2 article templates exist n the system with a matching Brand/Publication Channel/Category combination, the one in the Dossier is preferred over the other one. The user is therefore not asked to choose between the 2 available templates. Context: A Publish Form is opened that is set up for a Publication Channel of type 'Facebook' which is assigned to Brand 'WW News' and Category 'Sport'. The Dossier does not contain any article templates. Action: The 'Create New Text Component' button is clicked. Result: Content Station looks for any article templates in the Dossier that are assigned to Brand 'WW News', Publication Channel 'Facebook' and Category 'Sport'. No article template is available in the Dossier so article templates elsewhere in the system are referenced. No article templates exist that have the same Brand, Publication Channel and Category combination as the Dossier. The next best match is the combination of Brand and Publication Channel, for which 2 templates exist: #4 'ww-news-facebook-default' and #5 'ww-news-facebook-default2'. A window appears showing these 2 templates from which the user has to make a choice. Context: The Home page of Content Station is viewed. Action: The 'Create New Article ' button is clicked. Result: A window appears showing all templates of all Brands to which the user has access. The user has to choose the template to use. The article template determines the default article components and the styles for formatting the text. By assigning it to a Brand/Publication Channel/Category combination, it can be targeted to a specific form of output. Step 1. Create the article template. Step 1a. Create a new layout. Step 1b. Create one or more text frames and assign an appropriate Element label. Step 1c. Define the required paragraph styles and character styles. Step 1d. Save this article as an article template. Assign it to a specific Brand/Publication Channel/Category combination to target it for use to that particular output. Step 1e. Repeat these steps to create as many article templates as needed. Step 1a. Create a new document in InCopy. Step 1b. Create any paragraph styles and character styles as necessary. Step 1c. Save this article as an article template. Assign it to a specific Brand/Publication Channel/Category combination to target it for use to that particular output. Step 1d. Repeat these steps to create as many article templates as needed. The componentDefs.xml file defines which article components can be added to the article after it has been created. Note: When this value is set to "false", the component is removed from the Components list in Content Station as soon as the component is part of the article. This is the case when the component is already part of the article component, or when it is manually added by the user. Example: You might want to use set this option to 'true' for graphic components while setting it to 'false' for the header component. Step 2. Configure the required components as necessary.